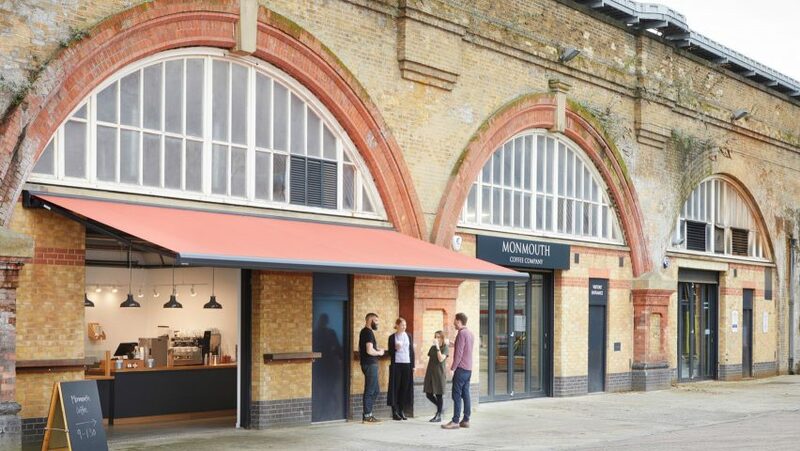 Interior design studio ID: SR has transformed seven railway arches in south London into offices for Monmouth Coffee, completing workspaces in simple materials that draw focus to the industrial setting. Encompassing all of the brand's operational facilities, the Monmouth Coffee office plays host to work areas for staff, training facilities, a cafe, and a roastery that will produce five tonnes of coffee per week. The 1,304-square-metre office forms part of Spa Terminus, a series of railway arches in Bermondsey dedicated to food production and wholesaling by independent brands. This is the second set of offices for the company, after having grown out of another workspace in Bermondsey and a basement on Monmouth Street, Covent Garden where they started making and selling coffee in 1978. When it came to developing the interiors, ID:SR worked alongside Anita Le Roy – the founder of Monmouth Coffee – on forming an aesthetic that didn't cover up the industrial bones of the building. "The inherent qualities of the arches immediately lent themselves to creating industrial spaces, but were also surprisingly adaptable. It allowed us to create engaging workplaces and weave together an unusually broad mix of uses," said Helen Berresford, head of the studio. "Rather than fight the grit and texture of the fabric of the arches, we have tried to celebrate it, adding moments of finesse and quality to lift the overall experiences of the spaces." Rows of desks that run across the main workrooms sit beneath black steel frames, which the studio hopes will provide a sense of enclosure to employees whilst "preserving the drama and scale" of the vaulted ceilings. Some of the frames have been used to delineate casual meeting areas, which are dressed with small black dining tables, wheat-coloured rugs, and oversized pendant lamps. The more private meeting rooms are closed off by expansive panes of glass. Spaces throughout the office are connected by arched doorways, which nod to the shape of the roof. While the studio has maintained a majority of the archways' exposed brick surfaces, some walls have been painted rust red or covered with beige acoustic panels. The underside of the arches have all been clad with white corrugated steel to give the impression of a "light, clean environment". The archway where coffee is produced is anchored by two huge roasters imported from California, while the cafe features a concertina glazed door that can be pushed back to grant access to passersby on the street who want to grab a coffee. ID:SR is the interior design division of Sheppard Robson, a London architecture firm which has previously created a barn-style extension for an equine care unit in Edinburgh, and completed a children's hospital in Johannesburg. Last year, design studio Sella Concept also overhauled railway arches in London to form cocktail bar Night Tales, which is decked out with salmon pink furnishings.